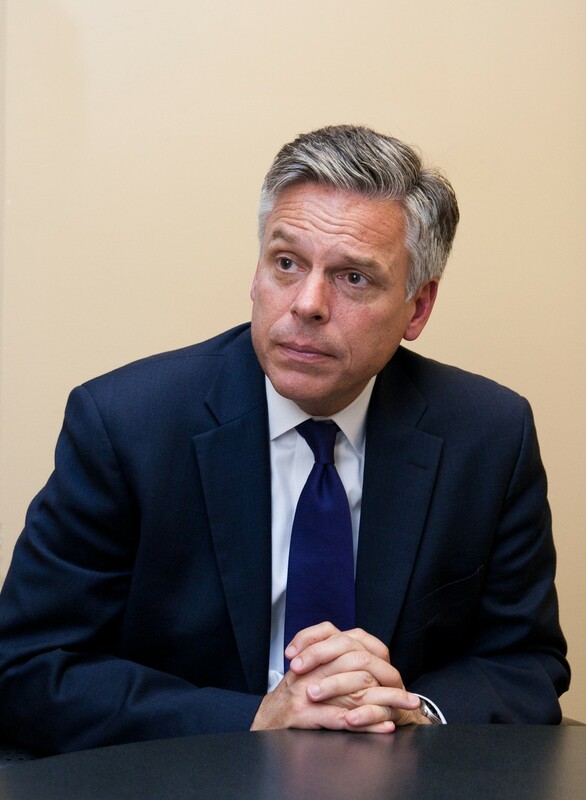 Uncommon Interview: Jon Huntsman, Jr.
Jon Huntsman, Jr., governor of Utah from 2005–2009 and former United States Ambassador to China, dropped his bid for the Republican presidential nomination in January after a third-place showing in the New Hampshire primary. Since then, he has been appointed to the Board of Directors of Ford Motor Company and was among the candidates for the presidency of the World Bank. The Maroon sat down with Huntsman after his lecture at International House earlier this month to discuss the viability of a two-party system, the wildcard of North Korea’s new supreme leader, and the future of American industry. CM: In your talk just now, you said that your views paralleled those of Republicans Abraham Lincoln, Teddy Roosevelt, Dwight Eisenhower, and Ronald Reagan. But party platforms and beliefs can change drastically over time: What do you think it means to be a Republican? JH: My view of conservatism has always been pretty consistent, and it comes out of Bill Buckley’s school of conservatism: it’s small government; it’s economic freedom; it’s a strong and confident national security infrastructure; it’s pursuing the ideals of life, liberty, and the pursuit of happiness. It doesn’t need to be too much more complicated beyond that. I think we’ll return to some of these basic ideals in time, but it will take a leader to get us there. Party priorities go in cycles, and I think the cycles are pretty tied to leaders of particular periods of American history. So will the Republican Party reformulate itself to some extent, maybe take off some of the edges, maybe some of the areas that are non-core to small government, a strong economy, and a confident foreign policy? We’ll get there, but it will take a leader to get us there. CM: How do you see the talks right now in Beijing between North Korea and the United States affecting our relationship with China? Do you see the agreement to ship more food aid [now suspended] to North Korea changing our diplomatic relations, or are we, as The Washington Post put it, “buying the same horse again”? JH: We are. They [North Korean party leaders] have a history of dissembling, and the only different wrinkle this time is that there’s a new head of the party, Kim Jong-un, who’s taken over for his father. It’s hard to know what is in his mind. He was just such an unknown commodity, such a cipher, when he started taking the positions of power, that I think the most valuable part of the talks going on now will be to see whether or not there’s any desire to begin to transform a highly rigid state, which is probably, I think, the most evil on the face of the Earth, in terms of how it treats its people. We don’t know the answer to that, so some level of engagement through the six-party process might give us an indication as to whether or not they’re willing to go beyond just the same old dissembling—‘We’ll meet and we’ll pretend to talk about a nuclear-free Korean Peninsula in exchange for the following…’ It’s always been a cycle. We’ll have to see if there’s anything new. CM: You’ve mentioned the possible need for another voting option, now and in future elections. Why is a third party important? JH: I don’t think there will be any way to stop third, fourth, fifth party movements, because you’ve got the rise of a very mobile generation. You’ve got social networking technology; you’ve got the internet that allows for people to get their messages out with speed and clarity like never before, the ability to raise money and organize. All of the necessary ingredients that go into a successful political campaign are there, ready to be captured. We’re just a couple of election cycles premature, perhaps. You know, duopolies don’t last forever. They haven’t in American politics; they don’t in business. And you know, competition is a good thing, and when parties begin to focus on things that are less germane than the American people would like, they turn to alternatives. It will be interesting to see if during this election cycle there’s talk of that, if anyone’s able to organize any effort around this vehicle called the internet. It’s hard to know. I think we’re early, but I do believe that will be the trend of the future. CM: You were recently appointed to the Board of Directors of Ford Motors, and there was discussion about how you will bring an Asian direction to the company. Can American corporations come back with the same vigor and growth through Asian investment as Asian sectors have seen in their exports to the US? JH: You’ve got multiple large markets that any large company is servicing, and I think it’s important to note that first of all, I don’t know what we’ll be talking about. I attend my first board meeting tomorrow [March 14], so it’s hard to know what my focus will be, or what the deliberations will be. But obviously that was part of my background that they found attractive. We have such a global marketplace today, and so much in the way of disposable income that is being amassed in China and India, just to begin the conversation, where you’ve got some of the largest middle classes in the history of the world that are taking shape or form. They’re going to be consumers. They’re already consumers. And for a viable company in the auto sector and beyond, you’ve got to be a global player. It isn’t about the U.S. market as much as it is servicing a customer base that is global, that endures to the benefit, ultimately, of the U.S. market, because where are the cars designed? Where is the accounting done? Where is the legal work done? Where is headquarters? So you can expand market share throughout the world, which is what any corporation like that will try to do. You have to do that to survive, but for the U.S., it brings benefits, in that success overseas endures to the benefit of the home market. That’s sometimes lost in discussions about the international marketplace.